I found Consedines book very patronising – he has seen the light, we haven’t sort of message. 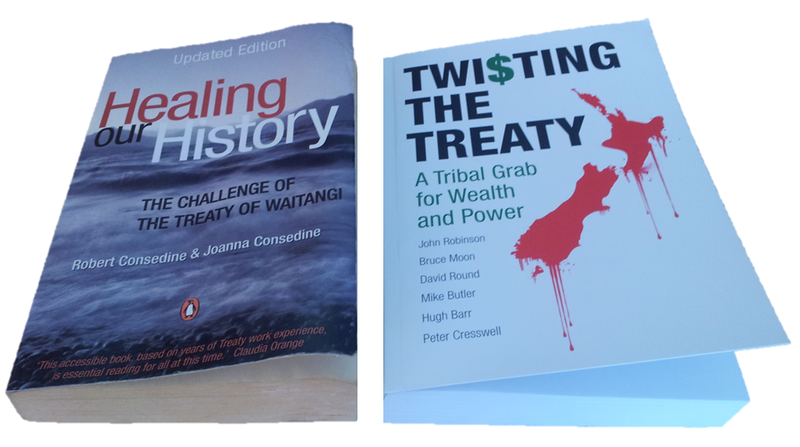 Now I know what I do abt the Treaty and its’ industry,, books that try & make non-Maori feel guilty i have no patience for. Mind you I have a sinking in my gut when i read what our children are being taught at school which plays right into the thinking of people like Consedine and his ilk.. . . and condons anything corporate Maori claim / want. Slightly off track here but apparently the Queen will be signing a Charter to abolish discrimination in all 54 (?) Commonwealth countries!! At last, an end to our racist discrimination by the hideous part maori greedy liars. The Queen has saved us!! Woohooo!! Ha, probably more to do with homosexuals than the real racism aimed at 90% of NZers. Come on Elizabeth, please stop this oppression now! 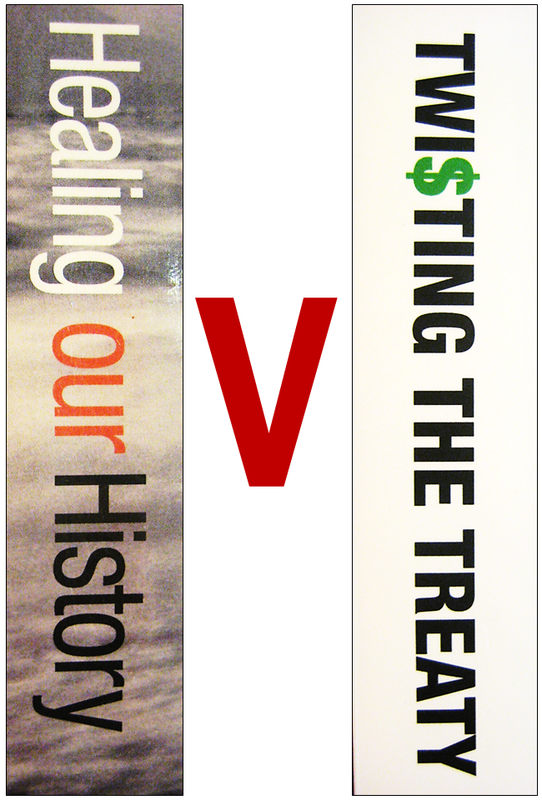 Interesting article and looking forward to reading ‘Twisting The Treaty’ as soon as I have finished ‘The Great Divide’. Probably won’t bother with ‘Healing Our History’ as I am already familiar with those lies. The Great Divide is also excellent, as you will know, Derejk..
I’ve no idea how Ian Wishart gets through so much work – and all of such a high standard. It would be nice if our Queen was on our side, wouldn’t it? The Queen will be on the side the government of the day tells her to. And now the way the world is, even right wing goverments are actually centre left wing idealists parading themselves as conservatives or nationalists. Just take a look at John Key. Near all academics in NZ are coerced into towing the line or else making big trouble for themselves, ie loosing their jobs, funding or credibility. That’s where we’re at. I sent you an e.mail yesterday to your e.mail address, with two photographic attachments regarding an unbelievable matter. It is so unbelievable, that I sent you the two photos as proof. Actually, considering what is going on now, it probably is not unbelievable at all….what you would expect, come to think of it!! Could you please confirm that you got it. I read a comment on the TV3 website yesterday where a man from Tauranga says that his council pays local iwi thousands upon thousands of dollars per year to dump treated efluent into the sea. This caused some debate in my workplace with one part maori defending it. But we were unsure if it was true or not. If so then we can assume that this will be surreptitiously happening in every city and town in the country. Marvin, I just tried phoning the Tga city council ( one of the most useless PC, maori-loving, incompetent, wasteful, councils in NZ….also about $450 million in debt) regarding this question. I have to phone back this afternoon. I also want to know if its true that iwi are now included in the vetting panel for senior (mis)management jobs at the Tga city council. I’ll let you know how they will no doubt try to fob me off! Marvin, the person was not available again this afternoon and I must call back tomorrow except I will be away tomorrow for a few days so I will try again when I return. However, I can confirm that yes, it is true that local iwi are on the vetting panel for senior (mis) management job applicants. I believe the CEO, deputy CEO, several HR and…..a local iwi representative are on this shameful racist panel. All the qualifications in the world will not get the job unless the applicants wear a massive bone carving over their suit and probably a few words of maori in the interview. How did this ever become acceptable????? The myth that maori are one with nature has been proven wrong over and over, but still these PC councils fall over themselves to give money to a particular part race despite being hundreds of millions of dollars ( Tga city council over $450 million and rising!! ) in debt!! Anyone else from Tga, phone TCC and complain….and lets get all the incumbents OUT at the next election. This has been going on right under my nose for years and I didn’t even know! I’d be very interested to know the answer to both of these questions. If the effluent is treated, what’s the problem? And if iwi are vetoing (local) government appointments, that’s outrageous – so much more intrusive than mere consultation. My chances of scoring my dream job with the Tauranga City Council are looking bleaker by the day. Yes John, I asked the council what’s the problem with treated effluent going into the harbour but was told I’d have to phone back later. As for the iwi on the vetting panel for (mis)management jobs…well, the person I spoke with ( a different person to the one I needed to answer the other question) confirmed it was true. I had recently heard it was true but confirmed it with a call to the horse’s mouth. Sorry John, but unfortunately, that dream Tga City Council job (“Tga Councillor In Charge Of Apostrophes” ) just may go to someone else with not quite your expertise on the subject!!! PS, the way Tga City Council waste money, I would not be too surprised to know that they really do have someone on the payroll in charge of apostrophes!!!!!! You seem to be using more than your quota of exclamation marks there, Derejk. So based on what you and Mike are saying, the Tauranga iwi now control both the council and the port. As an interesting aside, the Tauranga council wouldn’t let me hold my meeting in their Baycourt Theatre – but had no trouble allowing the port company to use it for their AGM, or a Maori leaders group for their hui. I dread to think of all the millions that go towards ‘Maori’ funding for all sorts of things. So much of it is probably buried in a ton of paper that it would take a genius to fish it all out and add it up. Every time I open the paper there is so many million being spend on something new – or at the least the first time I have heard of it. They talk about millions as though they are just peanuts, when in fact it is huge bucks that is involved. And none of these “maoris” are even “maoris” – all part “maoris”. All of the “maori” stuff is lies and garbage. Once they are in they seem to think they are above everything and everyone. They fill themselves with self-importance and it all goes straight to their heads. They lose touch with reality well and truly. The answer is to have racial equality everywhere. But then, we know that and that’s what we are fighting for. In the meantime what extraordinary unfixable mess will be created – and at what enormous cost? As I posted yesterday the local Tauranga paper has a story about ‘local iwi’ now having 5 people on a 7 people board for the Port Company, to advise the Port company about environmental and ‘Maori’ issues to do with the port and harbour. All on consultancy fees of course. I would dearly love to know exactly what ‘Maori issues’ really are – apart from collecting large sums in consultancy fees of course!!. Before we came here they were warring with each other continuously, practising cannibalism and killing female babies. They were not a cohesive society and hunted various species of bird and animal life to extinction, so they definitely weren’t at all mindful of looking after anything for the future in those days. To say they are cunning at finding ways to fleece the taxpayer, would be a gross under-statement. Aren’t we first class idiots for allowing it to happen. The new revised maori history taught in schools and to newcomers is that (before the British) put themselves as one with nature much like the native Americans and Aborigenese of Australia, which we know is one big lie. Look at them now. At least their leaders’ only concern is making big money from the hard pressed tax payers in any way. Maori are making billions via a weak and limp wristed government led by John Key and his shyster Finlayson. They lay claim to anything now and more or less get it. City and town councils up and down the country are bullied and extorted by iwi for consultation fees that the country is completely unaware of. The new New Zealand mafia backed and protected by government, free to furtively extort what they can from anyone. Who gave them this power? John Key did. A weak and spineless PM looking tough on moari, but giving the country away behind closed doors. Maori separatists have never had it so good. A perpetual source of never ending money for nothing to people who claim part maori status. What’s the answer to JK, one may ask? All else would be even worse than him. Maybe he’ll have an epiphany, but we won’t hold our collective breath for that to happen. I feel that there’s alot more being given to maori radicals that we don’t know about. I simply can’t work it out why our leaders capitulate to their near every whim, and hand over millions hand over fist to keep them quiet. If our own government are being extorted by these parasites, then where is the country heading and how can it be stopped? Marvin, you have voiced the severe concerns of all of us who are striving for a racial equal society and the only way it can be stopped, in my humble view, is for everyone to stand up together and tell John Key he has to stop it. No ifs or buts – he has to stop it now. I tell you what, if he could see his support slipping away he would do a U-turn right there and then. He’s only interested in staying in power and will do whatever it takes. However, another thought occurs to me and that is, he is relatively young and perhaps he too was brainwashed in school or has been brainwashed since. Remember he has his ‘shyster’ minister Finlayson constantly at his elbow probably feeding him even more fraudulent information. Once they get into power they seem to become insulated from the rest of the population so I reckon he has also lost touch with reality. A quick sharp slap on the wrist by the masses might do the trick but how to wake/motivate them? Maybee your question is rhetorical Helen but if not you could take a couple of hours with some friends and handout the flyer (JA wrote) outside the Nelson Museum outlying the lies at their current display ? Just a thought, no pressure or drama . . . every little helps to educate the masses as you say…. I believe the display at the Nelson Museum has now finished, Carol. Whitcoulls Paraparaumu do not have it in stock, their computer tells them no sign of it being ordered. When first asked for a copy the assistant perused the Maori section, when advised it was more likely to be in the NZ non fiction section appeared to be a bit suprised. I hope you ‘enlightened’ Whitcoulls, Owen. We must let them know in no uncertain terms that this book should be readily available and read by all New Zealanders. Had a look in the Paper Plus near me (Richmond, Nelson) again today and it is right there in with the New Releases facing people as they come into the store. Full marks to them. If someone could find a policy plank that would attract all the obviously unhappy people who signed the referendum re asset sales, there would be enough list seat members in Parlament, in that party, to really be able to achieve something to stop all these treatygate rorts.. Maybe even get rid of the unelected list ministers in our present government. How about a policy of email referendum to all paid up members of the party whenever there were any contentious issues and voting according to the outcome. The party would then be able to concentrate on the core issue of racial equality with a consultation promise for everything else. This should appeal to an audience such as those against asset sales.